1st Group Business Meeting | Educational Group E.G. Stratigakis S.A.
At 17:00 on Saturday 27th February 2010, in the Galaxy Room of the Athens Hilton Hotel, the first E.G. Strategakis Group Business Meeting commenced. 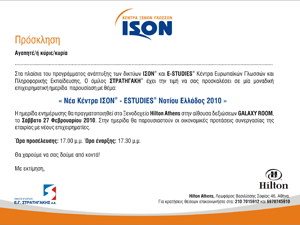 The focus of the meeting was “New ISON – Estudies Centres, Southern Greece 2010”. This presentation was attended by prospective franchisees who had visited the Group’s stand at the International Franchise Exhibition 2010 and who wished to learn further information concerning investment proposals and to discuss in detail with the executives of our Development Department.